What Will Happen To The Class 379 Trains? Greater Anglia’s fleet of thirty Class 379 trains are being replaced by by a brand new fleet of Class 745 Stadler FLIRT EMUs which will be fixed 12-car trains on Stansted Express services and Class 720 Bombardier Aventra EMUs on Cambridge services. These trains have a high specification. Ability to work as four, eight and twelve-car trains. 2+2 seating in Standard Class. 2+1 seating in First Class. Full compliance with all Persons of Reduced Mobility rules. I also suspect the following is true about the trains. The ability to run on 750 VDC third rail electrification could be added reasonably easily. Lithium-ion batteries to give a limited range, can be fitted. The top speed could be upgraded to the 110 mph of the closely-related Class 387 trains. The trains have end gangways and could be certified to run through the core route of Thameslink, like the Class 387 trains. So they would appear to be a very useful train. So what will happen to the trains? This is my speculative list of possible uses. In some ways it’s strange that these reasonably new trains are being replaced on Stansted and Cambridge services. They are being replaced by Stadler Class 745 trains, which like the Class 379 trains are 100 mph trains. In the next decade or so, the West Anglia Main Line is to be upgraded. There will be four tracks at least between Tottenham Hale and Broxbourne stations. Cambridge South station and the East West Rail Link will have been completed. Line speed will have been improved to at least 100 mph along its full length. The High Meads Loop will be developed to allow more trains from the West Anglia Main Line to use Stratford instead of the overcrowded Liverpool Street as a London terminal. I suspect the number of fast services between London and Cambridge along the West Anglia Main Line will be increased. So are performance upgrades available for the Class 745 trains, which will deliver these improved services? 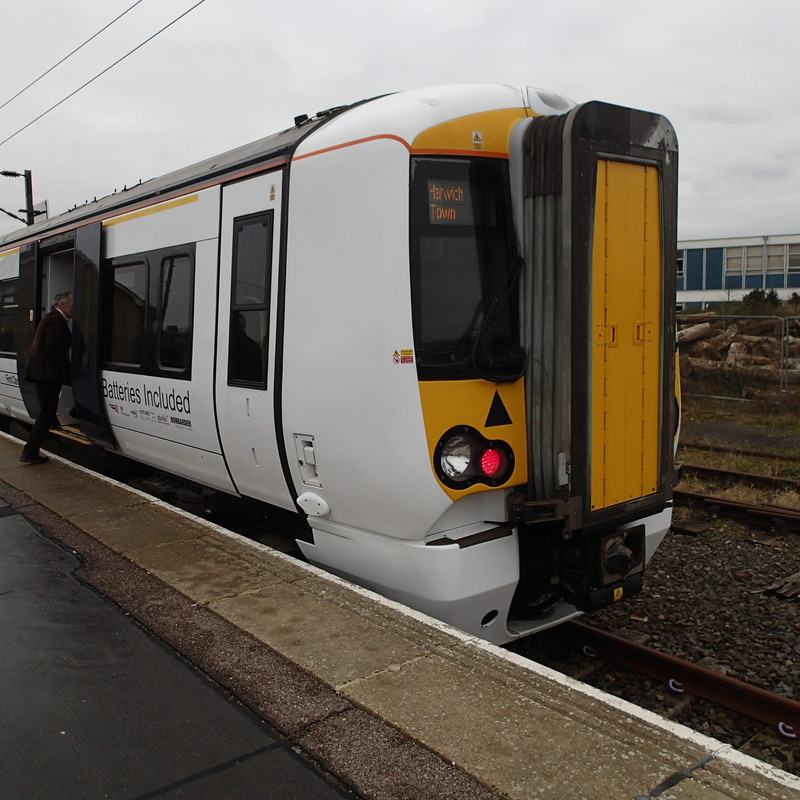 If Stadler are late with their delivery of the Class 745 trains, the Class 379 trains will continue to be used on Stansted and Cambridge services. This is discussed in this article in Rail Magazine, which is entitled Contingency Plans In Place For Greater Anglia’s Main Line Fleet. But surely, this would only delay their cascade to other operators. According to Wikipedia, all of the replacement Class 745 trains, are scheduled to enter service in 2019, which should mean that the Class 379 trains should be available for cascade to other operators, sometime in 2020. Under Future in the Wikipedia entry for Corby station, this is said. It is planned that a half-hourly London St Pancras to Corby service will operate from December 2019 using new Class 387 trains, once the Midland Main Line has been electrified beyond Bedford as part of the Electric Spine project. Network Rail has also announced that it plans to re-double the currently singled Glendon Junction to Corby section as part of this scheme. In the December 2017 Edition of Modern Railways there is an article, which is entitled Wires To Corby Now in 2020. Carillion is to deliver electrification of the Midland Main Line to Corby, but electric services will not start until December 2020, a year later than previously envisaged. The article also states the following. A fourth track is to be installed between Bedford and Kettering. Track and wires are to be updated so that new 125 mph bi-mode trains can run between St. Pancras and Derby, Nottingham and Sheffield. Improvements to the current electrification South of Bedford. Everything should be completed, so that the new bi-mode trains could enter service from 2022. It should be noted that Wikipedia says this about the Future of the East Midlands Trains franchise. The franchise is due to end in August 2019. The Invitation to Tender is due to be issued in April 2018, which will detail what improvements bidders for the franchise must make. The contract will then be awarded in April 2019. This could give the following project schedule on the Midland Main Line. April 2019 – Award of new East Midlands franchise. August 2019 – New East Midlands franchise starts. December 2020 – Electric services to Corby start. December 2022 – Bi-mode services to Derby, Nottingham and Sheffield start. These dates would fit well with the retirement of the Class 379 trains by Greater Anglia in 2020. Current timings between Corby and London are 71 minutes with four stops. I don’t think it would be unreasonable to assume that the improved track and new trains would be designed so that the timings between Corby and London would be reduced to under an hour, with a round trip of two hours. If this can be achieved, then just four trains of an appropriate length will be needed to meet the required two tph timetable. Four-car services would need four trains. Eight-car services would need eight trains. Twelve-car services would need twelve trains. It might not be possible to run eight and twelve car services due to platform length restrictions. If the two hour round trip could be achieved by an existing Class 387 or an uprated Class 379 trains, then either of these trains would be a shoe-in for the route. Otherwise we’ll be seeing something faster like a Class 801 train. But if services are to start in 2020, there would be a problem to manufacture the trains in the available time, as the contract will only have been awarded in April 2019. I think that St. Pancras to Corby is a possibility for Class 379 trains, which may need to be uprated to 110 mph. On the other hand, Class 387 trains wouldn’t need to be uprated. West Midlands Trains, who have a similar need for their Euston to West Midlands services, have ordered 110 mph Aventras. So perhaps the new East Midlands franchise will do the same. This would be more likely, if Bombardier come up with the rumoured 125 mph bi-mode Aventra. Or they could buy a mixture of Class 800 and 801 trains. I don’t think the Class 379 trains will work St. Pancras to Corby. A Class 379 train was used for the BEMU trial, where a battery was fitted to the train and it ran for a couple of months between Manningtree and Harwich, using overhead power one way and battery power to return. Was this class of train chosen, as it was one of the easiest to fit with a battery? After all it was one of the later Electrostars. This article on the Railway Gazette from July 2007 is entitled Hybrid Technology Enters The Real World. It describes the experimental conversion of a Class 43 power-car from a High Speed Train into a battery-assisted diesel-electric power-car. A second article in the Railway Gazette from October 2010 is entitled First New Stansted Express Train Rolls Out. It describes the Class 379 train in detail. This is an extract. Although part of the Electrostar family, the Class 379 incorporates a number of technical changes from the original design developed in the late 1990s, making use of technologies which would be used on the Aventra next-generation Electrostar which Bombardier is proposing for the major Thameslink fleet renewal contract. The body structure has been revised to meet European crashworthiness requirements. The window spacing has changed, with the glass bolted rather than glued in place to enable faster repairs. The couplers are from Dellner, and the gangways from Hübner. Top speed is 160 km/h, and the 25 kV 50 Hz trains will use regenerative braking at all times. The last statement about regenerative braking is the most interesting. To my knowledge electric trains that use regenerative braking had never run on the West Anglia Main Line before and that to handle the return currents with 25 KVAC needs special and more expensive transformers. The obvious way to handle regenerative braking at all times without using the electrification is to put an appropriately sized battery on the train. If Bombardier have done this on the Class 379 train, then it might be a lot easier to fit a large battery to power the train. This would explain why the trains were chosen for the trial rather than a train from a more numerous variant. The result was a trial of which few, if any,negative reports can be found. Little has been said about the performance of the train. However, in this document on the Network Rail web site, which is entitled Kent Area Route Study, this is said. London buses are completely electric powered. |Ashford to Brighton is 62 miles, so a round trip would be 124 miles. The document doesn’t say anything about how many stops were made in the tests, but I’m sure that Bombardier, Greater Anglia and Network Rail have all the data to convert a Class 379 into a viable IPEMU or Independently Powered Electric Multiple Unit. As to how long it takes to charge the battery, there is an interesting insight in this article from Rail Magazine, which is entitled Battery-Powered Electrostar Enters Traffic. This is said. It is fitted with six battery rafts, and uses Lithium Ion Magnesium Phosphate battery technology. The IPEMU can hold a charge for 60 miles and requires two hours of charging for every hour running. The batteries charge from the overhead wires when the pantograph is raised, and from regenerative braking. The two-one ratio between charging and running could be an interesting factor in choice of routes. I quoted from this article in the Railway Gazette from October 2010 earlier. This is said. Although part of the Electrostar family, the Class 379 incorporates a number of technical changes from the original design developed in the late 1990s, making use of technologies which would be used on the Aventra next-generation Electrostar. So would it be a reasonable assumption to assume, that if batteries can be fitted to a Class 379 train, then they could also be fitted to an Aventra? This article in Global Rail News from 2011, which is entitled Bombardier’s AVENTRA – A new era in train performance, gives some details of the Aventra’s electrical systems. This is said. This was published in 2011, so I suspect Bombardier have refined the concept. But it does look that both battery variants of both Class 379 trains and Aventras are possible. What important lines could be run by either a Class 379 train or an Aventra with an appropriate battery capability? I will refer to these trains as IPEMUs in the remainder of this post. I feel that one condition should apply to all routes run by IPEMUs. The 2:1 charging time to running time on battery ratio must be satisfied. As Network Rail are prepared to write the three paragraphs in the Kent Area Route Study, that I quoted earlier, then the East Coastway and Marshlink Lines, which connect Brighton and Ashford International stations, must be high on the list to be run by IPEMUs. All the route, except for about twenty-four miles of the Marshlink Line is electrified. Brighton and Ashford International stations are electrified. Some sections have an operating speed of up to 90 mph. There is a roughly fifteen minute turnround at the two end stations. The last three points, when added together, show that in each round trip, the train has access to third-rail power for 162 minutes and runs on batteries for 80 minutes. Does that mean the 2:1 charging to running ratio is satisfied? I would also feel that if third-rail were to be installed at Rye station, then in perhaps a two minute stop, some extra charge could be taken on board. The third-rail would only need to be switched on, when a train was connected. It looks to me, that even the 2015 test train could have run this route, with just shoe gear to use the third-rail electrification. Perhaps it did do a few test runs! Or at least simulated ones! After all, with a pantograph ready to be raised to rescue a train with a flat battery, they could have run it up and down the test route of the Mayflower Line at a quiet time and see how far the train went with a full battery! Currently, many of the train services along the South Coast are run by a fleet of Class 313 trains, with the following characteristics. There are a total of nineteen trains. They were built in the late 1970s. They are only three cars, which is inadequate at times. They are 75 mph trains. The trains are used on both the East Coastway and West Coastway Lines. Replacing the trains with an appropriate number of Class 379 trains or Aventras would most certainly be welcomed by passengers, staff and the train companies. Diesel passenger trains could be removed from the route. There could be direct services between Ashford International and Southampton via Brighton. One type of train would be providing most services along the South Coast. There would be a 33% increase in train capacity. Services would be a few minutes quicker. For Brighton’s home matches, it might be possible to provide eight-car trains. The forty-year-old Class 313 trains would be scrapped. The service could even be extended on the fully-electrified line to Bournemouth to create a South Coast Seaside Special. I looked at Chris Gibb’s recommendation for this line in Will Innovative Electrification Be Used On The Uckfield Line? Electrification of the branch using 25 KVAC overhead. Electrification of tunnels with overhead conductor rail. How would this be affected if IPEMUs were to be used? The simplest way to run IPEMUs would be to install third-rail at Uckfield to charge the train. Current timings on the route are as follows. Hurst Green station is the limit of the current electrification. Adding these times together, show that in each round trip, the train has access to third-rail power for 91 minutes and needs to on batteries for 82 minutes. It looks like the 2:1 charging to running ratio is not met. To meet that, as the round trip is three hours, that means that there probably needs to be two hours on electrification and an hour on batteries. So this means that at least eleven minutes of the journey between Hurst Green and Uckfield station needs to be electrified, to obtain the 2:1 ratio. It takes about this time to go between Crowborough and Uckfield stations. Crowborough will have the new sidings, which will have to be electrified. The spare land for the sidings would appear to be to the South of Crowborough station in an area of builders yards and industrial premises. Crowborough Tunnel is on the route and is nearly a kilometre long. The route is double-track from Crowborough station through Crowborough Tunnel and perhaps for another kilometre to a viaduct over a valley. The viaduct and the remainder of the line to Uckfield is single track. The single track section appears to have space to put the gantries for overhead electrification on the bed of the original second track. If you apply Chris Gibb’s original recommendation of 25 KVAC, then electrification between Crowborough and Uckfield station, might just be enough to allow IPEMUs to work the line. The sidings at Crowborough would be electrified. About half of the electrification will be single-track. Crowborough Tunnel would use overhead rails. Power could probably be fed from Crowborough. The regenerative braking would be handled by the batteries on the trains. Changeover between overhead power and batteries would be in Crowborough station. Buxted and Uckfield stations wouldn’t be complicated to electrify, as they are single-platform stations. I very much feel that running IPEMUs between London Bridge and Uckfield is possible. The Windermere Branch Line is not electrified and Northern are proposing to use Class 769 bi-mode trains on services to Windermere station. Current timings on the line are as follows. If you add in perhaps ten minutes charging during a turnaround at Preston, the timings are just within the 2:1 charging ratio. So services from Windermere to at least Preston would appear to be possible using an IPEMU. These trains might be ideal for the Windermere to Manchester Airport service. However, the Class 379 trains are only 100 mph units, which might be too slow for the West Coast Main Line. The IPEMU’s green credentials would be welcome in the Lakes! This is said under Services in the Wikipedia entry for Harrogate station, which is served by the Harrogate Line from Leeds. The Monday to Saturday daytime service is generally a half-hourly to Leeds (southbound) calling at all stations and to Knaresborough (eastbound) on the Harrogate Line with an hourly service onwards to York also calling at all stations en route. Services double in frequency at peak time to Leeds, resulting in 4 trains per hour (tph) with 1tph running fast to Horsforth. There are 4 tph in the opposite direction between 16:29 and 18:00 from Leeds with one running fast from Horsforth to Harrogate. Evenings and Sundays an hourly service operates from Leeds through Harrogate towards Knaresborough and York (some early morning trains to Leeds start from here and terminate here from Leeds in the late evening). Proposals have been made to create a station between Harrogate and Starbeck at Bilton, whilst the new Northern franchise operator Arriva Rail North plans to improve service frequencies towards Leeds to 4 tph from 7am to 7pm once the new franchise agreement starts in April 2016. I believe that the easiest way to achieve this level of service would be to electrify between Leeds and Harrogate. IPEMUs might be able to go between Harrogate and York on battery power. Leeds and York are both fully electrified stations. If a link was built to Leeds-Bradford Airport, it could be worked on battery power and the link could be built without electrification. The electrification could be fed with power from Leeds. There is also the two-mile long Bramhope Tunnel. Full electrification between Leeds and Harrogate would allow Virgin’s Class 801 trains to reach Harrogate. I’m fairly certain that there’s a scheme in there that with minimal electrification would enable IPEMUsy to reach both a new station at Leeds-Bradford Airport and York. These routes show that it is possible to use IPEMUs to run services on partially-electrified routes. As I said earlier, the 2:1 ratio of charging to running time could be important. Class 379 trains were built to provide fast, comfortable and suitable services between London Liverpool Street and Stansted Airport. Because of this, the Class 379 trains have a First Class section and lots of space for large bags. Surely, these trains could be found a use to provide high-class services to an Airport or a station on a high-speed International line. But there are only a limited number of UK airports served by an electrified railway. Most of these airports already have well-developed networks of airport services, but Class 379 trains could provide an upgrade in standard. In addition, the following airports, may be served by an electrified heavy rail railway. All except Doncaster Sheffield would need new electrification. For that airport, a proposal to divert the East Coast Main Line exists. Possibilities for airport services using IPEMUs, based on Class 379 trains with a battery capability would include. The completion of the Ashford Spurs project at Ashford International station will surely create more travellers between Southampton, Portsmouth and Brighton to Ashford, as not every Continental traveller will prefer to go via London. Class 379 IPEMUs,with a battery capability to handle the Marshlink Line would be ideal for a service along the South Coast, possibly going as far West as Bournemouth. Birmingham Airport is well connected by rail. I think that as train companies serving the Airport, have new trains on order, I doubt we’ll see many Class 379 trains serving the Airport. Various routes have been proposed for the Bristol Airport Rail Link. In my view, the routes, which are short could be served by light rail, tram-train or heavy rail. As the proposed city terminus at Bristol Temple Meads station would be electrified and the route is not a long one, I’m pretty sure that a Class 379 IPEMU could work the route. But light rail or tram-train may be a better option. Gatwick Airport station is well served by trains on the Brighton Main Line, running to and from Brighton, Clapham Junction, East Croydon, London Bridge, St. Pancras and Victoria, to name just a few. Gatwick also has an hourly service to Reading via the North Downs Line, which is only partly electrified. In my view, the North Downs route would be a classic one for running using Class 379 IPEMUs. The Class 379 trains were built for an Airport service. Four cars would be an adequate capacity. No infrastructure work would be needed. But operating speed increases would probably be welcomed. Third-rail shoes could be easily added. Several sections of the route are electrified. Gatwick Airport and Reading stations are electrified. Currently, trains take just over an hour between Reading and Gatwick Airport. Would the faster Class 379 IPEMUs bring the round trip comfortably under two hours? If this were possible, it would mean two trains would be needed for the hourly service and four trains for a half-hourly service. There may be other possibilities for the use of Class 379 trains to and from Gatwick Airport. Luton Airport keep agitating for a better service. So would a direct link to Gatwick using Class 379 trains be worthwhile? Class 379 IPEMUs could provide a Gatwick to Heathrow service using Thameslink and the Dudding Hill Line. Class 379 IPEMUs could provide a Gatwick to Ashford International service for connection to Eurostar. I also feel that, as the trains are closely-related to the Class 387/2 trains used on Gatwick Express, using the Class 379 trains on Gatwick services would be a good operational move. Also, if Class 379 IPEMUs were to be used to create a South Coast Express, as I indicated earlier, two sub-fleets would be close together. Earlier I said that the Harrogate Line could be a route for IPEMUs, where services could run to York, if the Leeds to Harrogate section was electrified. A spur without electrification could be built to Leeds-Bradford Airport. Based on current timings, I estimate that a Bradford Interchange to Leeds-Bradford Airport service via Leeds station would enable a two-hour round trip. An hourly service would need two trains, with a half-hourly service needing four trains. Manchester Airport is well connected by rail and although the Class 379 trains would be a quality upgrade on the current trains, I think that as Northern and TransPennine have new trains on order, I doubt we’ll see many Class 379 trains serving the Airport. Looking at these notes, it seems to me that the trains will find a use. As the trains are only capable of 100 mph, they may not be suitable for doing longer distances on electrified main lines, unless they are uprated to the 110 mph operating speed of the Class 387 trains. The main line where they would be most useful would probably be the East and West Coastway Lines along the South Coast. Converting some into IPEMUs would probably be useful along the Marshlink and Uckfield Lines, in providing services to Gatwick and in a few other places. I also feel, that Aventras and other trains could probably be designed specifically for a lot of the routes, where Class 379 trains, with or without batteries, could be used.